Source: Automated Merchant Services, Inc.
ICVERIFY is a complete, PC compatible credit authorization software program which includes Credit Card Authorization/Draft Capture, Check Guarantee and ATM/Debit Card Authorization with menu driven simplicity-faster and more efficient than ever before! Can operate invisibly to the user, using simple ASCII or command line multi-tasking interfaces. In addition, under Windows ICVERIFY includes a DLL (Dynamic Link Library ) interface. ICVERIFY supports all major prinpads including: Verifone, Atalla, Magtek, NCR, etc. Establish or maintain your merchant account with any bank or third pary. ICVERIFY is certified with all major processing networks allowing you to use a software solution rather than old-fashioned bank terminal. ICVERIFY does everything that a bank terminal does at a fraction of the cost and with times the fucntionality!. 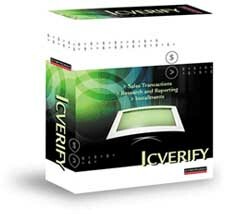 ICVERIFY is available in Windows 95, Windows NT, Windows 3.x and DOS, single user and network. (Novell and Lantastic). Spanish (Punta de Venta en Espanol) and other language versions are available. Automated Merchant Services, Inc., 1999 University Drive, Suite 210, Coral Springs, FL 33071. Tel: 954-752-0999; Fax: 854-755-2393.